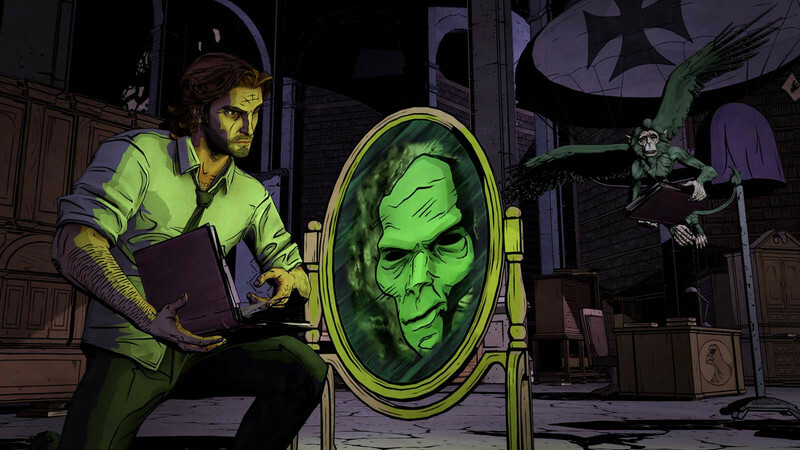 The Wolf Among Us is the latest comic book adaptation from The Walking Dead's Telltale Games. Accepted as canon in comic creator Bill Willingham's ongoing Fables universe, it's getting a five-part episodic release. Chris Brown investigates the first offering, Faith. In 2012 Telltale Games finally delivered on the promise of its pedigree. After a number stumbles, outright failures, and some moderate-yet-underwhelming successes, the company delivered The Walking Dead, a runaway success and testament to the skill and talent merely hinted at since its founders left LucasArts. Garnering praise from the gaming public and critics alike, it became the game of 2012, and arguably set a new standard in interactive storytelling. 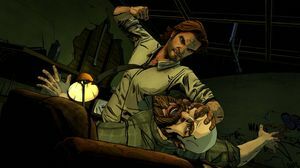 Telltale is now seeking to build on the success of The Walking Dead with The Wolf Among Us – another graphic adventure based on another much-beloved comic book franchise. 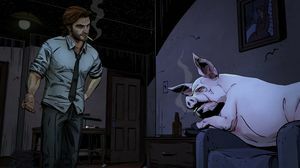 Based on the Fables series by Bill Willingham, The Wolf Among Us puts the player in the role of Bigby Wolf aka The Big Bad Wolf from Little Red Riding Hood and The Three Little Pigs. Having long-since abandoned his nefarious child- and pig-eating ways, Bigby is now the chain-smoking hard-living Sheriff of Fabletown, a refuge for a community of displaced characters from fairytales and folklore. Forced to scratch out a living in present day New York after being run off their homeland by an all-conquering foe simply known as The Adversary, this is a broken and wrung-out community on the fringe of society and barely hanging on. In short, this is no fairytale. Through the use of spells called Glamours, the “Fables” are able to take on human form in order to blend in with society, which succeeds to a greater or lesser degree depending on a Fables' disposition or personal circumstance. Tasked with the dual jobs of protector and enforcer, Bigby struggles to keep the peace and maintain the secrecy of Fabletown and its residents. Then a murder on the steps of his apartment begins a mystery that's quite unlike any detective story. 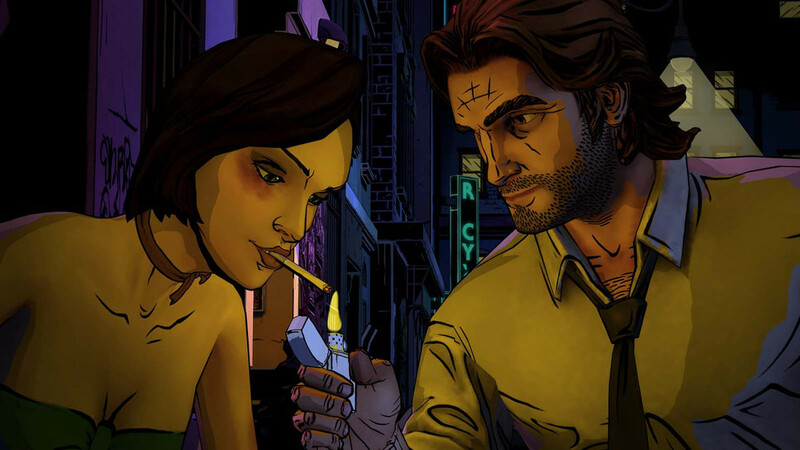 The Wolf Among Us plays almost identically to The Walking Dead: it’s a third-person adventure game where the player interacts with objects in the environment and – most importantly – converses with the varied characters inhabiting the world. However there are a few refinements, such as the addition of a walk faster toggle makes traversing scenes quicker and backtracking less of an irritation. Also seeing some attention are the quick time-oriented action sequences, although despite attempts to make them more responsive, they remain a chore, and are easily the weakest part of the game. The quick time event is an overused mechanic anyway, but here they feel tacked on: for a game that’s all about choice and consequence, hard-fail QTE’s just don’t fit. In fact, most non-conversation parts of The Wolf Among Us game feel shallow, unrewarding, and little more than busy work. The most obvious example of this is when Bigby needs to investigate a crime scene, which boils down to a simple case of select the next item, listen to the dialogue, and repeat. This is a real shame as these sections could have been a nice addition but instead feel like a real missed opportunity. As for the rest of the gameplay – well, there really isn’t much actual gameplay on offer. 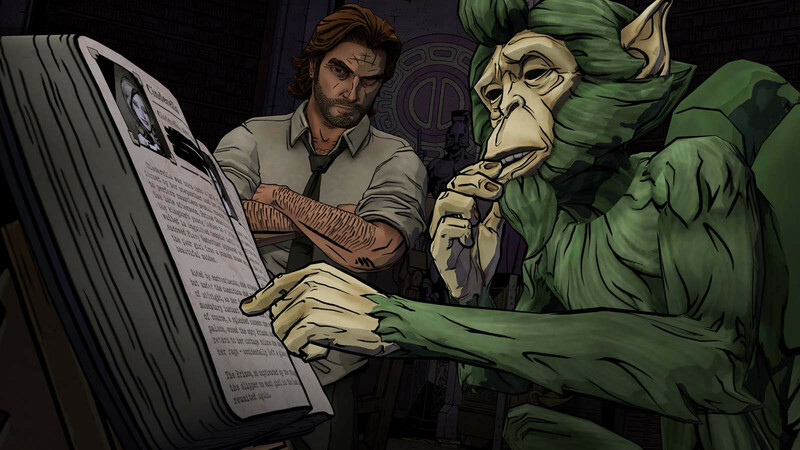 However, this is a game where the narrative is the primary focus of the experience, and thankfully that is where The Wolf Among Us really shines. Telltale have taken everything they learned from The Walking Dead and stepped it up a notch or three. The comic-noir tone of the game is perfectly delivered by some stellar writing. Never overwrought or underplayed, it finds an easy balance between the grim and the Grimm. The rare instances of humour are black and occasionally self-referential, and even the fairytale references are deftly-handled and never feel forced or out of place. The core mystery that drives the central plot of this episode is both compelling and gracefully blends the best of its noir influences with its outlandish setting. Everything unfolds organically, with each discovery only deepening the mystery and further drawing the player in to the world. This is storytelling of the highest order – a standout achievement in modern gaming. 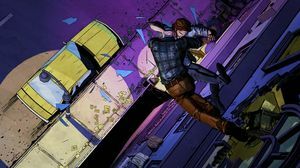 Where some use bombastic and larger-than-life characters to drive a story and engage the player, The Wolf Among Us takes the fantastical and makes it feel grounded and real. On top of that, the voice acting is universally exceptional. Each of the game’s diverse personalities are so flawlessly portrayed that even the most preposterous of characters have an emotional depth and resonance that makes them completely believable and surprisingly sympathetic. In order to emulate its comic book source, Telltale utilises the same cell-shaded graphical style as The Walking Dead; all simple flat colours and thick black outlines. The big departure here though is that use of colour. In order to evoke the noir-esque tone of the world as well as its bizarre nature, the palette employed is cleaner and brighter, but no less restricted. Where The Walking Dead was all muted tones and contrasting reds, The Wolf Among Us uses deep purples and blues, warm orange and rich greens to paint its scenes. These colour accents highlight the bleakness of world through their contrast with the muted greys and washed out natural tones that make up the majority of each scene. It’s a simple, beautiful, effective art style. In spite of its gameplay shortcomings, The Wolf Among Us is in every way an improvement over The Walking Dead’s first season. Excellent writing, art direction, and voice acting present the player with a world that feels lived in even as it’s slowly crumbling. 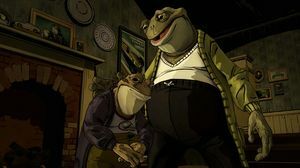 Characters are compelling and interesting, and Fabletown feels real, as do the problems facing its residents. Moreover, the player’s choices are less black and white, and the ultimate consequences of those choices much less predictable, but no less interesting for it. That all makes the two hours spent in-game feel all too short, and the wait for the next installment all too long. 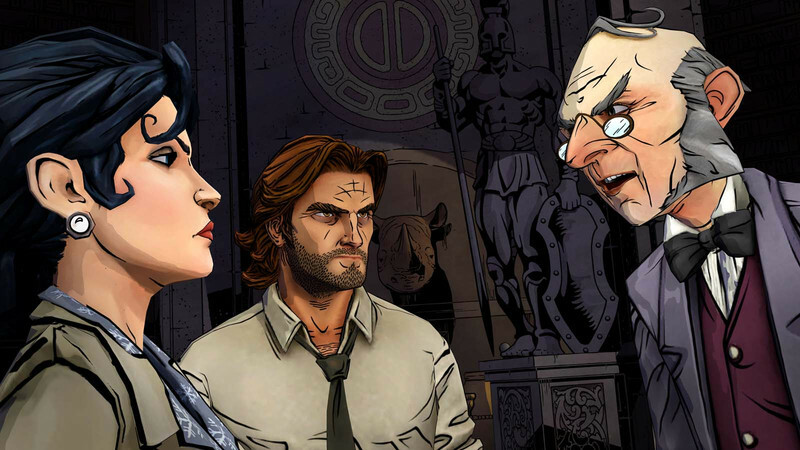 With its compelling storytelling, rich characterisations, and engaging player choices, The Wolf Among Us succeeds in spite of its gameplay short comings, and looks to be another genre-defining title from the team at Telltale Games. Ups Excellent writing, a compelling story, and interesting and fleshed out characters all brought together with exceptional voice acting in a beautifully painted world. Downs Extremely simplified and minimalist game mechanics, awkward and out of place quick time events, and an excruciating wait for the next chapter. "I wish I’d thought of that." A prequel to the comic books.